The IUCN Red List of Threatened Species (also known as the IUCN Red List or Red Data List), founded in 1948, is the world's most comprehensive inventory of the global conservation status of plant and animal species. 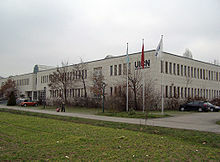 The International Union for the Conservation of Nature and Natural Resources (IUCN) is the world's main authority on the conservation status of species. Starting in June of 2010, the IUCN red list has authorized the production of distribution maps from their spatial data. There are currently ~25,000 species on the Red List with spatial data. Assessors citation: Jan Willem Arntzen, Jaime Bosch, Mathieu Denoël, Miguel Tejedo, Paul Edgar, Miguel Lizana, Iñigo Martínez-Solano, Alfredo Salvador, Mario García-París, Ernesto Recuero Gil, Paulo Sá-Sousa, Rafael Marquez 2008. Chioglossa lusitanica. In: IUCN 2010. IUCN Red List of Threatened Species. Version 2010.1. <www.iucnredlist.org>. Downloaded on 17 June 2010. Spatial data citation: 2009, IUCN (International Union for Conservation of Nature), Conservation International & Natureserve. If you have some sort of GIS software installed on your computer (check list here) that can read shapefiles, download the spatial data from spatial data. Check if the species you want to draw a map for does not have a distribution map already (check the species category, Category:Animal distribution maps, Category:Flora distribution maps, or Category:IUCN distribution maps). Use as background a free world map, such as the one found at Natural Earth (public domain). For specific countries, you can also use the ones at CloudMade (CC-BY-SA-2.0). Export the map for the species you are interested in PNG or SVG formats. Upload it to Commons, with the information mentioned above. Check that the maps in Category:IUCN distribution maps have the information above. Check if the maps are categorized properly. Check if newer data is available at the IUCN website.